With a stay at The Nakula Villas in Legian (Dewi Sri), you'll be within a 15-minute drive of Legian Beach and Kuta Galeria Shopping Arcade. Featured amenities include a 24-hour front desk, luggage storage, and laundry facilities. Guests may use a shuttle from the airport to the hotel for a surcharge, and free self parking is available onsite. 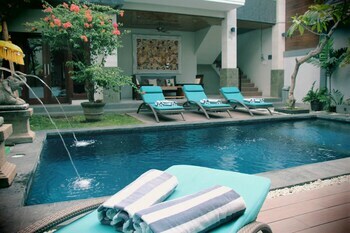 When you stay at Yamari Villa in Senggigi, you'll be near the beach and 9 minutes by car from Pura Batu Bolong. Free self parking is available onsite. When you stay at Gili T Resort in Gili Trawangan, you'll be by the sea, within a 10-minute walk of Gili Trawangan Night Market and Gili Trawangan Harbor.